This is the guy who had the run in with the photographer yesterday,it was not Dale Sr.
Tupes...maybe it was rusting in the mud and muck? Yeah, I thought of that too. If it was just under the waterline, in the muck, pulling it out of the water may have left some of the muck still on it. Still, it seems weird to me. Also, LE is very tight lipped on this case, so I sure would like to know who the reliable source is. Smith was originally granted custody of his children with Parker, but his custody was revoked. The children are now under the care of Parker's mother. Thank goodness those toddlers are safe now. The chain has nearly 1,800 acres of clear water and hard sand bottom, with beds of peppergrass, eelgrass and hydrilla scattered offshore. We think this is old news, Ono, not current. No local media is reporting on this at this time. Hey Tupe, just thought of something. The bottom of Lake Conway is sand. Sand is more coarse than mud or dirt. Sand explains the weathering of the case...like the absence of original color could be compared to scrubbing a stain out of a pair of jeans whereas the friction during scrubbing lightens the area the stain was in. Sand would do the same thing. I updated the map. Not sure the exact location yet of where in the lake it was found. I'll update it again when we can pinpoint the location. Lol. Why? If those twins are gonna be with a grandparent, why can't they be with Yvonne - afterall, they lived with her for crying out loud! I wonder why other news sources have not reported this. Omg yeah you're right & I knew this, just not thinking bc I'm thinking about that cell case & where it could have been found. Thank you Brandi! It was also reported that they just came to a custody agreement - Dale & Yvvone, I assumed over visitation. Could it be that Fox misreported or stretched it a bit? Or was custody really revoked? I think IF custody had been revoked, all the news outlets would have made that a big story. Bold by me... Early in the case a guy that was walking his dog the night Michelle disappeared noticed a truck (long haul) parked on the side of the road by the lake. He reported this bc he thought it was odd that the truck was there for that length of time and then a young woman was reported missing. The police couldn't track down whose truck is was or what it was doing there bc the guy didn't get a tag. 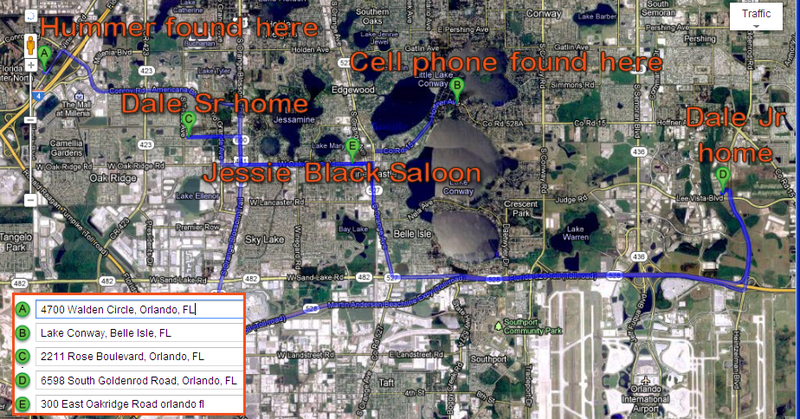 Don't know if it's all related but wow if it is considering Michelle's phone was just found in the same area. #MichelleParker's mother Yvonne Stewart gives an emotional statement. Believes her daughter may be dead. I believe I have it pinpointed accurately now. Ono, I'm the same way, so you're not alone honey. I'm always antsy. Thank gosh I'm not a child anymore bc Christmastime would be killing me right now with all these wrapped gifts! Brandi, thank you. Great map! Could it be the bridge on Nela Ave? Yes, Brandi ... absolutely fantastic. In my view, the suspect took some back roads to & from his dad's place; I feel so sorry for her family & friends. It's not looking good. Brandi, here it is exactly! You & Nirthern Rose are spot on! Even more thanks to protectkidz! Brandi, here it is exactly! You & Northern Rose are spot on! Page created in 6.15 seconds with 21 queries.